The UNESCO World Conference on Educations for Sustainable Development (WC-ESD) adopts The Aichi-Nagoya Declaration and the launches the Global Action Programme. IAU represented its Members and strongly advocated for higher education for sustainable development at both the International Conference on Higher Education for Sustainable Development and the UNESCO World Conference on Education for Sustainable Development! First, the International Conference on Higher Education and Sustainable Development organized by United Nations University (UNU), the Government of Japan along with several partner organization including IAU on 9 November. The International Conference brought together more than 700 participants from around the globe who debated the various roles higher education plays in fostering sustainable development. 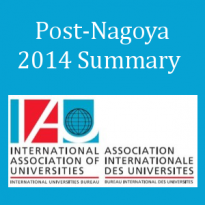 The Conference adopted the Nagoya Declaration on higher education for sustainable development. A key message from this event was the need to strengthen the ‘whole institution’ approach in order to integrate Education for Sustainable Development fully and to engage beyond boundaries and disciplines in higher education. Second, IAU played an important role in the UNESCO World Conference on Education for Sustainable Development (WC-ESD) which took stock of the achievements of the UN Decade on Education for Sustainable Development and charted the way forward. It was held in Aichi-Nagoya Japan on 10 to 12 November. The UNESCO WC-ESD was attended by 76 Ministers and Deputy Ministers and 1000 Delegates who came from 148 countries. It was the largest and best attended UNESCO Conference in long time. This speaks for the importance given by governments to sustainable development and to the role of education and higher education in pursuing sustainable development in its broad terms. The Declaration adopted at the World Conference serves as a call to world leaders to support the transformative role of education and higher education towards sustainable development, and to recognise the essential role and responsibility of education - including higher education - institutions for creating sustainable societies by fostering change and the new mind-sets it required to achieve it. This essential role of education in shaping the Future we want and the agreement that ESD adds an important dimension to the achievement of educational quality was emphasised by all speakers in the Opening Plenary: Ban Ki-Moon, UN Director General who joined by video insisted on the fact that the world cannot wait for solutions to come spontaneously; action needs to be undertaken and scaled up: “There is no Plan B because there is no planet B”. Naruhito, His Royal Highness the Crown Prince of Japan, Mrs. Irina Bokova, UNESCO’s Director General, Her Royal Highness Princess Lalla Hasna of Morocco, President of the Mohammed VI Foundation for Environmental Protection, as well as youth representatives, teachers and civil society called for a strong commitment to sustainable development by all governments and all education stakeholders. Representatives of Higher Education Institutions adopted the Aichi-Nagoya Declaration on Education for Sustainable Development unanimously expressing their renewed commitment to implement and pursue promises made in previous declarations, including IAU’s 2014 Iquitos Statement. As documented in the final report on the UN Decade, ‘Shaping the world we want’, which drew extensively on resources of the IAU global portal on Higher Education for Sustainable Development (www.iau-hesd.net), all agreed that much had been accomplished since the start of the Decade. Yet the scope and scale of the challenges ahead require far more concerted and collective action than that undertaken so far. Scaling up the various and numerous initiatives and drawing connections between them will be a central challenge in the new post-2015 Agenda, and the education goals and targets, which will be finalized in the coming months. The UNESCO World Conference on ESD drew attention to the need for far more cross-cutting measures, drawing on work by both Ministers of Education and higher education and Ministers of the Environment but spilling also into the cultural and economic realm. In higher education, far more inter-disciplinary learning, real world problem solving and closer links with civil society groups were seen as important paths to the profound change still needed if universities were to make their full contribution to sustainable development locally and globally. In his presentation during the IAU co-organized workshop on higher education and research at the World Conference, the IAU president stressed the need for a better balance between the economic, social, cultural and ecological forces steering our education and research. He called for a shift from emphasis on production to preservation, from maximization to optimization and from ownership to stewardship and finally from ego to eco. The UNESCO World Conference launched a Global Action Programme (GAP), created through the collective commitments of many stakeholders and UNESCO partners. “We were able to share successful initiatives from all over the world, to help government representatives and other key stakeholders formulate new goals and objectives. We have shaped these into a Roadmap for ESD that will implement the Global Action Programme”, said Mr Qian Tang, Assistant Director-General for Education of UNESCO. IAU will next build bridges between the work carried out so far in this domain and the work that will be presented at the World Education Forum 2015 in Incheon, Korea in May.